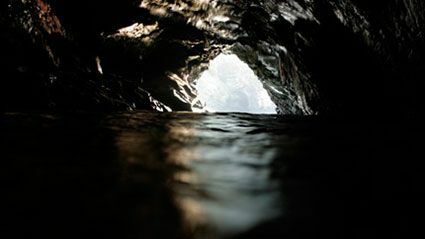 Stone Hole is a new collaborative exhibition of large digital photographs by Crispin Hughes and a timelapse film by Susi Arnott, made in tidal sea-caves along the shoreline of North Cornwall. In 2006, Hughes exhibited âUnquiet Thames' at the Museum of London in Docklands, which scrutinised enclosed tidal spaces along the London shoreline. Digital photographs stitched into large-scale panoramas were complemented by a soundtrack to re-create the sensation of hiding from the light and from the world above/outside; of seeking calmness and âsafety' in what are in reality threatening environments. Stone Hole is a direct development, both technically and thematically; stitching stills to re-make and distort time as well as space, involving film as well as composite photographs, and with the two artists working closely together on location. Challenging conventions in art that link landscape with beauty, the sublime and moral uplift, the work's concern is with human and geological flux and dissolution. Hughes' interest initially began as a response to the work of Patinir and the Quattrocento religious painters who depicted caves as small domestic stages for the personal dramas of the saints, their demons and mortifications. They show rock surfaces and textures in great naturalistic detail, but the gross morphologies and landscapes are improbable artifices. So Hughes and Arnott set about working in real sea-caves, only accessible at certain times of the tide. Being in these environments coincided with a series of medical crises for Hughes, increasingly reflected in the work. Similarly, Arnott's history of idiopathic epilepsy began to be reflected in moving images: the final film expresses the subjective experience of seizure and release. Working in sea-caves during periods of medical anxiety transformed an academically investigative project about landscape, geomorphology and art history into a more intense reflection on bodily states, the mind and our perceptions of the world and ourselves.